While I was home in Alaska, my mom made a delicious rhubarb pie. Back in Montana a couple of weeks later, a discussion with a coworker about the best flavors of pie (he was all wrong) prompted me to make another. 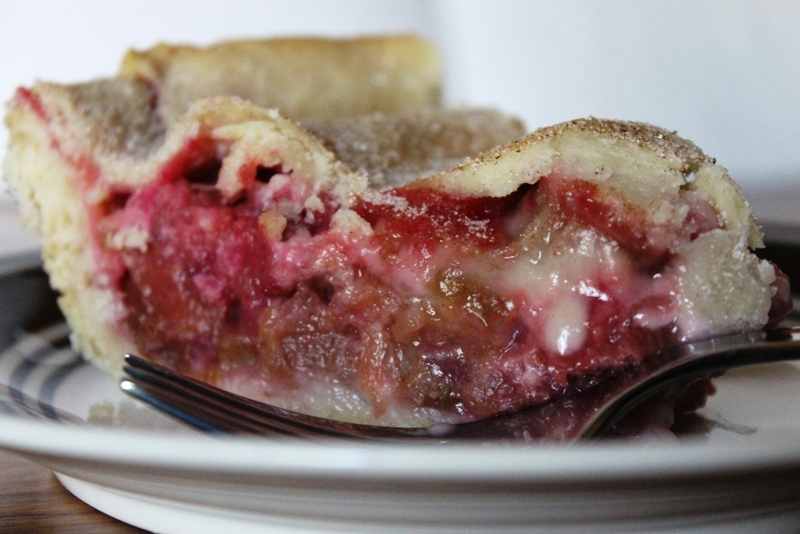 Unlike most rhubarb pies, this one contains no competing nor complimentary flavors. Purely rhubarb (and sugar, of course) it’s quite tart, very filling, and incredibly delicious. On its own for breakfast, or with ice cream for dessert, this pie is great both warm or cold and doesn’t taste nearly as sugary as the standard fruit pies. Furthermore, as the filling isn’t at all runny, it produces beautiful slices for plating. 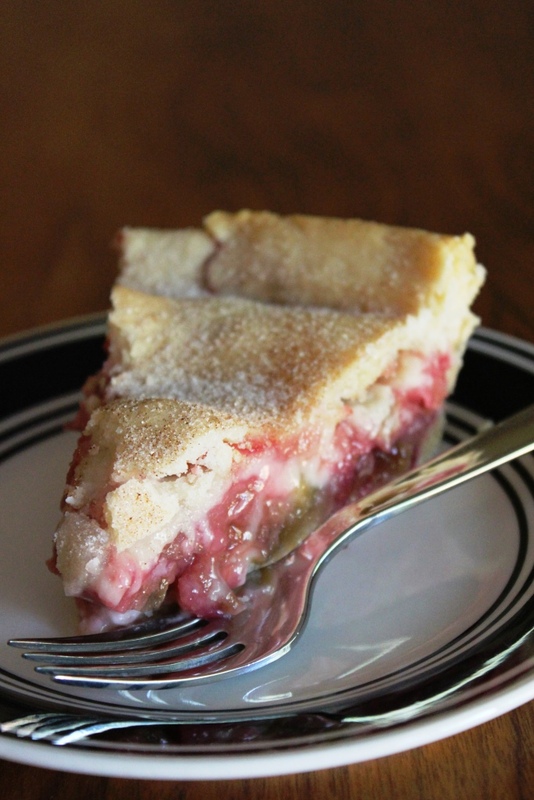 Since there’s no peeling involved, if you’re using a bag of chopped rhubarb out of the freezer (as I did) this is possibly the easiest summer pie you can make. And even if you’re using this year’s rhubarb harvest, chopping rhubarb never seems to be as much work as peeling and slicing apples or peaches. Especially if you “cheat” and use a pre-made crust, as that’s probably the most time-consuming part of the process. (I won’t judge you…much.) Its simplicity makes it my new go-to summer pie, although I’m sure I’ll make it all year around. It keeps well on the counter for several days and is sure to please any palate that likes rhubarb. If you’re looking for a particularly easy summer pie, this one is a fabulous option. Move your oven rack to its lowest position and preheat the oven to 450 degrees Fahrenheit. Layer the bottom crust in a pie plate and trim the edges to 1″ larger than the plate. In a small bowl, whisk together flour and sugar. Layer 1/4 of the flour mixture on top of the pie crust. Heap the rhubarb into the pie plate and cover with the remaining flour/sugar mixture. Cover with the top crust, sealing the edges and crimping, if desired. Cut vents in crust to allow steam to escape and sprinkle generously with the cinnamon and sugar. Bake (on the lowest rack) for 15 minutes, then reduce the oven to 350 degrees Fahrenheit and continue to bake for 45 minutes. 1 Frozen rhubarb works beautifully in this pie, just let it thaw (at least mostly) and drain before you place it in the crust.